My Name is Peter Kelly. I was SBA and LSBA on the Firedrake 1940-42. 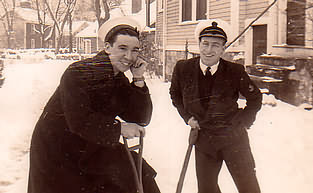 While in Argentia, Newfoundland in 1942 the coxswain (Peter Armstrong) came to me and said we have received a signal saying that your promotion to Petty Officer has been confirmed. As the ship is not allowed a S.B.P.O. you are now above our complement and are officially no longer a member of the crew. You will have to see the captain and request permission to stay aboard until your relief arrives. As soon as he does we are obliged to drop you off at the first British port we arrive at. I duly saw the Captain Lt. Com. Steven Norris and made my request which was granted. My relief took quite a while to arrive as we were in and out of port so fast he couldn't catch up with us. Eventually I was put ashore in Londonderry, returning to Chatham barracks where I was drafted to Royal Marine Siege Regiment. The first M.O. I served with in the Firedrake was Surgeon Lt. Ormond Gordon R.N. He was eventually replaced by Surgeon Lt. John Aldren R.N.V.R. John visited my wife and me at my parents home in Derbyshire soon after the war. I next traced him and telephoned him while on holiday in U.K. in 1972. I have lost touch since then. I was aboard the Firedrake at the Battle of Spartevento, which was very spectacular. It was the first time that I had traveled at high speed with the Firedrake. The sight of the Battleships, Battle Cruisers, together with the whole fleet racing along with Battle Flags flying, and darting in and out of smoke screens was something to remember. The Italians were too quick for us and retreated behind their minefields, so the pursuit was called off. The bombardment of Genoa was very heavy, some of the crew, myself included, were a bit unhappy about it, we felt we had no quarrel with the Italian people who had been plunged into war by Mussolini. 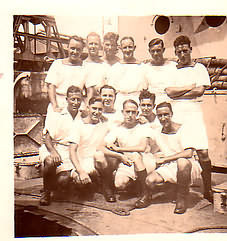 When we took the Italians off the submarine Durbo, they seemed to be happy to be out of the war. The running aground off Spain was due to fog and unpredictable currents. One Officer told me that the captain immediately sent for a copy of the Kings Rules and Regulations. Sometime during my time aboard we intercepted and captured a Danish ship, the "Sally Mersk" which had been captured by the Germans and used as a supply ship for the enemy in North Africa. I was with the boarding party which was swift and resulted in the immediate surrender of three very frightened German soldiers. 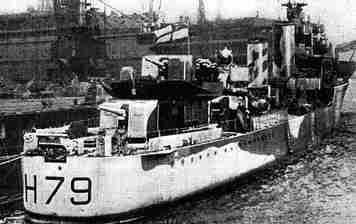 During the Malta convoy "Operation Substance" the Firedrake was leading the ships through the straits. She had sweeps out for mines which meant her speed and ability to maneuver was limited. The blast from the near miss lifted me off my feet. There was a lot of steam rushing out and sailors emerging from the engine room oily and shocked. The ship was stopped dead in the water and listing heavily. I can't vouch for the following information, but I believe the Captain sent a message to the engineer asking him if he could make steam. Somehow the message was mixed up. The Engineer had told the messenger, he would let the Captain know in 20 minutes. But the Captain received the message, "could make steam in 20 minutes", this message was conveyed to the Admiral, so the Admiral didn't order the abandonment of the ship. Firedrake was reprieved. The "Hunt Class" destroyer Edridge towed us out of the immediate danger area and stood by to supply fresh water when emergency repairs had been carried out. We then returned to Gibraltar under our own steam and went into dry dock for further repairs. On the way the whole of force H passed us in line ahead, each ship had cleared lower deck's, and the whole ship's company's gave us three rousing cheers as they passed. Firedrake's arrival in Gibraltar was greeted by a brass band and we found a big party taking place aboard the flotilla leader H.M.S. Faulknor. By returning to Gibraltar under her own steam the Firedrake had completed the millionth mile for the flotilla. The group photo is of 5 mess on board the Firedrake. Second from the right standing is: Jim Underwood (Lofty). Middle row left to right: Kelly (Me), Dawkins and Leslie Best. Front row middle: Medcalf and on the end is Lenny Robinson. The crew generally believed that we would return to Britain for further repairs and I bought oranges, and onions to take home. It was a shock to hear we were bound for Boston where we were to dry dock in the Navy yard. A lot of good fruit and onions had to be ditched in the ocean before entering harbour. After arriving in Boston we were transported by buses and private cars to an unused U.S. Marine camp in Connecticut. The surroundings were idyllic, with a fir lined lake and hills in the distance. We were allocated huts and had loads of lovely food served on stainless steel trays, steak, sausages, potatoes and of course ice cream. The next morning we explored the camp and surroundings, there was no canteen and no sign of a nearby town or village, we need not have worried because later in the day there was a queue of cars, all the occupants looking for a sailor or two to take home. The people of Boston opened their hearts and homes to us, the hospitality was unbelievable. I went with different shipmates to homes in and around Boston, some in Rhode Island, and Connecticut, and saw quite a lot of the country. At Christmas we all contributed part of our pay to entertain the hosts who had been so good to us. One family used to let me drive their car, it was a very big DeSoto and they told me to send my wife and son to the states as soon as possible and they would care for them. As much as I would have liked to do so it was impossible for British people to travel overseas at the time. When it was time to leave we were showered with presents and clothing for our relatives. My wife had her first pair of nylon stockings as soon as I got home. Photo right is of Lenny Robinson and myself at the Murray's home in Boston Massachusetts, Christmas time 1941. I remember Captain Norris well. He sometimes came to the Sick Bay in the cold evenings for a cup of hot cocoa. He was a keen gardener and used to talk about the best time to plant tomatoes etc. Of all my other shipmates I have no knowledge. I had a censored card from Dawkins sent through the red cross from a POW camp in Germany. I wrote in reply but never heard any more. I knew the Firedrake had been lost, but didn't know the details, and for the past 60 years believed all my shipmates had been lost.